Recent interest in the areas south-west and west of Crete and in the Ionian Sea between Greece and southern Italy have brought western Greece to the attention of the oil and gas exploration industry, spurred on by East Mediterranean discoveries like Zohr in Egypt and Aphrodite in Cyprus. Hellenic Hydrocarbon Resources Management (HHRM), which was established in September 2011, provides today an innovative route to the management of Greek hydrocarbon resources. The company is now studying new tenders for the area, suggesting that, despite the present low oil price, the search for hydrocarbons in Greece is of increasing interest, as new technologies boost the cost-efficiency of operations. Despite a couple of bid rounds, there has been very little exploration in Greece since the discovery of the ~40 MMbo (in-place) Katakolon field in the 1980s. 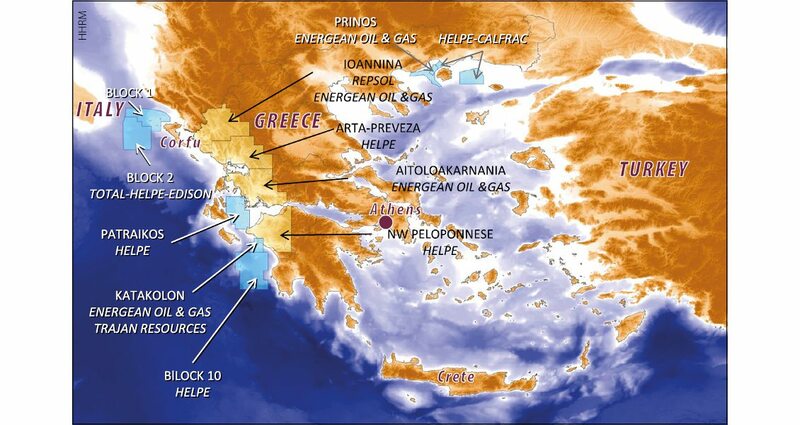 HHRM has therefore undertaken to attract international and domestic companies interested in investing in the exploration, development and production of hydrocarbons in Greece, operating as an independent authority to ensure flexibility and avoid heavy bureaucratic procedures. The immediate objectives of the company include the finalization of lease contracts, as well as negotiation and follow-up with the interested companies. The region of the Ionian Sea and Western Greece in general offers a ‘safe haven’ in the western part of the Eastern Mediterranean in comparison to trouble hot spots further east. Its strategic location means it is crossed by a number of gas pipelines, including the planned Trans Adriatic Pipeline from the Caspian to Europe, so co-operation between neighboring countries such as Greece, Italy and Albania is important. Edison, an Italian subsidiary of French company ERDF, is part of a consortium with Total and Helpe (Hellenic Petroleum) that is already exploring in Block 2, west of the island of Corfu, which it was awarded following the 2014 bid round. Edison holds similar concessions offshore Italy and is looking into continuity across the Adriatic Sea. 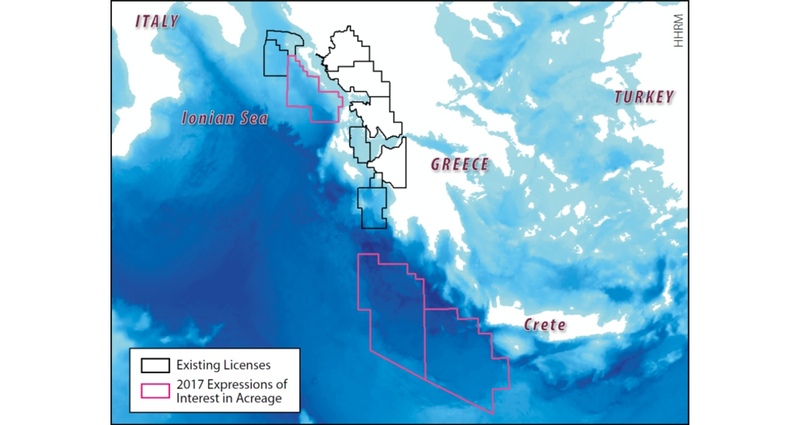 The industry has now turned its interest to the unexplored area west and south of Crete, based on interpretation of seismic from the multiclient survey acquired by PGS in association with the Greek government in 2012. This area is considered to be ‘high risk, high reward’ and has already attracted expressions of interest from a consortium of Total, Exxon and Helpe, which has initiated an international call for tenders for the exploration and exploitation of hydrocarbons offshore west and south-west Crete. Negotiations are also underway with Energean Oil and Gas, which is interested in a new area west of Block 2, which similarly has initiated a call for tenders. Interested companies should submit offers to HHRM within 90 days of the date of publication of the Invitation for Submission of Offers in the Official Newspaper of the European Union. HHRM is also overseeing the reprocessing with depth migration of 12,500 km of the 2012 2D seismic data acquired along the western and southern edges of Greece, which has been underway since July 2017. The pre-stack time migration of the fast track priority lines from south of Crete will be available in September 2017 and the pre-stack depth migration versions will be released in January 2018, with reprocessing completed by June 2018. Advances in wavefield separation and new de-multiple processes together with depth migration are expected to bring significant enhancements to the data. 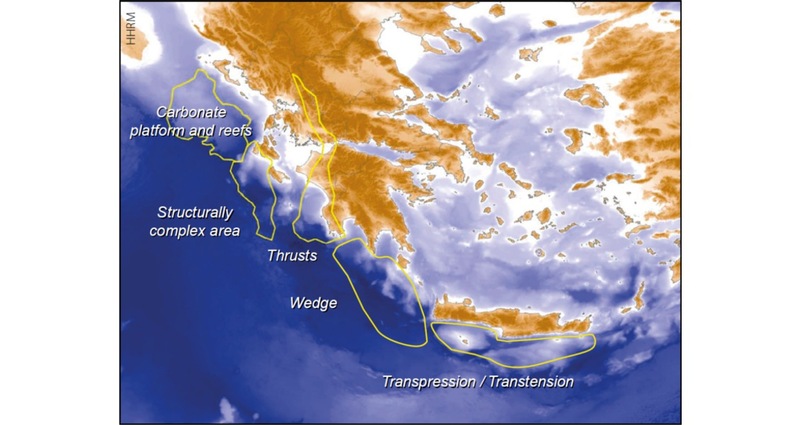 The acquisition of new seismic in selected areas is being considered by HHRM, including a 3D survey of up to 2,000 km2 on the eastern slope of the carbonate platform in the northern Ionian Sea, to the west and south of Corfu. Reprocessing of the new 2D lines will increase the geological understanding of the area and assist in planning the 3D survey. In addition, HHRM is proposing the acquisition of an infill 2D survey south of Crete with optimized line orientation and an infill 2D acquisition south of the Peloponnese; in total, up to 4,000 km will be acquired. Both surveys are subject to industry prefunding. In 2014 a bid round for blocks offshore Crete attracted no offers. Interest in the region has been growing so fast, however, that now, in mid-2017, the area held by the industry or under negotiation represents around 61% of the size of the total acreage offered in 2014, compared to 5% of that same area at the end of 2016. More acreage is expected to become available soon as companies awarded offshore blocks in the last round will have to relinquish 25% of their acreage, which, coupled with the information from the reprocessed data, may lead to a new bidding round by about 2020. There remain, however, some very basic questions about the geopolitical balance and policy that Greece should follow, bearing in mind its position at the crossroads of energy routes from the Eastern Mediterranean to Europe. The potential for finding important reserves of hydrocarbons in Greece has been a matter of national political debate for some years. While some argue that large discoveries will lead to ‘El Dorado’, others remain cautious. HHRM therefore hopes to bring together the right technical, legal and financial resources in order to help improve the institutional framework for hydrocarbons with the aid of skilled experts and experienced scientists and professionals.